Uber has added a 15p per mile fee onto every trip taken through its app in London to help drivers switch to electric vehicles. 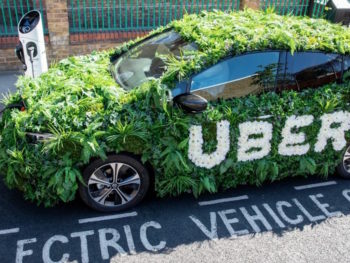 First announced in October, the new Clean Air Fee has been introduced ahead of April’s Congestion Charge changes – which mean that vehicles including private hire vehicles such as Uber will need to be zero-emission capable to avoid charges – and is intended to help drivers switch to EVs and PHEVs. In an email to customers, Uber said: “From Wednesday 16 January, a Clean Air Fee of 15p per mile will be included on every trip taken through the app in London. “This will only apply to miles travelled on a trip, and will not include miles travelled to your pick up location. An average Uber trip in London is three miles, meaning customers are expected to pay around 45p more. Funds will be ring-fenced and are expected to raise more than £200m to support drivers transitioning to electric vehicles over the next few years. Uber said it anticipates the first 20,000 drivers upgrading to electric vehicles by the end of 2021; the aim is for all cars on the app to be fully electric in London in 2025.